The game had two different releases: VGA (original) and SVGA (remake). See: Version differences. Both releases are included in the Leisure Suit Larry bundle, comprising Leisure Suit Larry 1 - 6. For details see: Version differences. The original 1993 "VGA" (low-resolution) version was released on floppies. It runs in DOS in 320x240 256-color mode. This version was also re-released on CD-ROM, with added speech. The 1994 "SVGA" (high-resolution) remake was released on CD-ROM, with updated graphics and full voice acting. It runs in DOS and Windows in 640x480 256-color mode. The GOG.com re-release uses ScummVM for the VGA version of Leisure Suit Larry 6, and DOSBox for the SVGA remake. 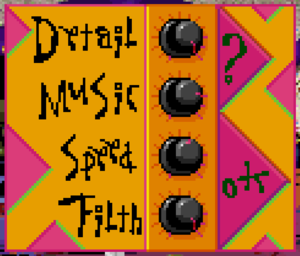 The GOG.com re-release uses ScummVM configuration file lsl6-cd.ini for the VGA version, and DOSBox configuration file dosbox_L6.conf for the SVGA remake. 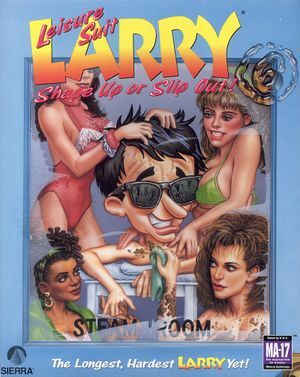 Available in the retail collection Leisure Suit Larry's Greatest Hits & Misses!. The SVGA remake requires an Intel 386 CPU, 4 MB of RAM and an SVGA card. ↑ 2.0 2.1 File/folder structure within this directory reflects the path(s) listed for Windows and/or Steam game data (use Wine regedit to access Windows registry paths). Games with Steam Cloud support may store data in ~/.steam/steam/userdata/<user-id>/765910/ in addition to or instead of this directory. The app ID (765910) may differ in some cases. Treat backslashes as forward slashes. See the glossary page for details. This page was last edited on 31 March 2019, at 00:48.